We provide a car rental service in Vilnius Airport (VNO), Downtown, Central Railway Station, Coach Station and any Hotel within and outside the city limits. It's possible to hire a car at any place of Vilnius. To get an offer for a car rent at the most convinient place for you in Vilnius you can choose a location "Hotel Delivery" and put an address in the comments field or send your request to our e-mail: reservations@primecarrent.com. Prime Car Rent company provides cars 24 hours a day 365 days a year. 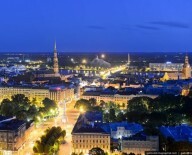 All car rental locations in Vilnius are working by one schedule.